Often the first step in selecting a public relations firm is the distribution of a request for proposal (RFP), a formal document that solicits information from firms in a prescribed format and timeframe. A finely constructed and well­-written RFP will generate detailed and meaningful responses from agencies in a consistent layout that allows firms to be compared side­-by­-side. Yet, writing the RFP itself can be a daunting task, especially if a client doesn’t have an internal procurement department. It doesn’t have to be a painful or difficult process, however. In our executive guide, Writing an RFP: Your Guide to Hiring a PR Firm, we provide a digestible, step-by-step guide to help. 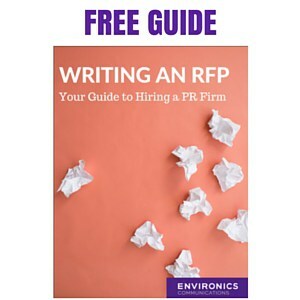 If you’re writing an RFP, this guide is the perfect place to start when hiring a PR firm.